Your riverfront room has a private French door entry off the lanai, a queen-size bed and is appointed island-style. Your private bath is several steps away. The open, island-style architectural design of the house takes full advantage of the sub-tropical beauty which surrounds it. Guests enjoy complimentary breakfasts or our catered meals while looking out on our gently flowing river, coconut and papaya trees and exotic tropical plants and flowers. Your host, Humberto, offers free vacation planning advice to ensure a delightful island vacation. For your explorations we provide (free) boggie boards, snorkel equipment and bikes. Or rent a kayak, launch into our river and paddle to our beautiful white sand beach with its crystal clear tide pools! Centrally located in Anahola on the east coast of Kaua'i, we are close to hidden sub-tropical beaches, as well as beautiful river, jungle and mountain walks. Yet Kapaa's shops and restaurants are only 10 minutes away. 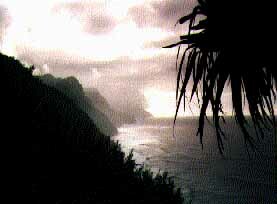 We are also midway between the rugged Na Pali cliffs of the north shore and the serene beauty of the Waimea Canyon on the west side of the island. To reserve your room and/or adventure, just E-mail your preferred dates and number of guests or call Humberto at (808) 823-0705, toll-free reservations line: (888) 281-8292. We're easiest to reach 8-10 a.m. or evenings (Hawaii time is 3 hrs. earlier than the W. Coast) and weekends. At other times, try my cell phone at (808) 635-7084. Messages may be left at all numbers.